Brody handles maintenance for each of our 12 outpost cabins. He came to us straight out of Confederation College in Thunder Bay. Brody has spent time working in the field of heating and air conditioning, and his knowledge of propane and plumbing is just what our operation needs! During the offseason, Brody heads back to Thunder Bay to work in the HVAC industry. Jordan was our Beaver pilot last year. He came to us from Thompson, in Northern Manitoba. 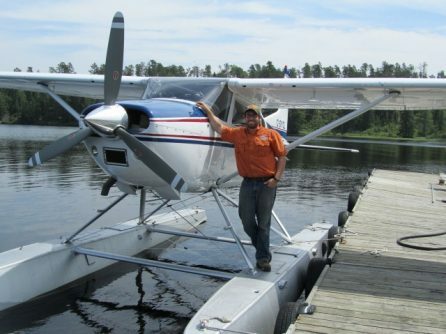 Nestor Falls works with only the finest bush pilots in Canada, and we’re lucky enough to have Jordan referred to us. Jordan knew he wanted to be a bush pilot since he was a young boy, and he’s been flying for four years in Northwestern Ontario. When Jordan isn’t flying, he likes to hunt, fish, and drinks Brava. This winter, he landed himself a year round flying job we wish him all the best. Nestor Falls can’t wait to welcome back Brody and Will–and many others–for the 2015 season!